We love baths. We like really, really, really love baths. Then again, who doesn’t? Think about how amazing it is to come home after a long day and soak in a nice, hot tub. It sounds heavenly. And what would make this experience even better? A big, inviting bathtub. It’t just you, a glass of wine and nothing but peace and quiet. We believe that every person, man and woman, deserves a nice relaxing bath. That’s why today we found some of our favorite bathtubs and posted them just for you guys. We aren’t trying to create bathtub lust or envy, but it may happen. Sorry about that! Enjoy these tubs and hopefully you can enjoy yours today or later tonight! When it comes to coastal design the best place to pull inspiration from is the beach and the coast itself. The design elements of the home can take direct cues from coastal environment surroundings. From the earthy tones to the natural textures, there are plenty of coastal accessories that can not only be pluck right from the beach, but also inspired by elements of the coast. Get inspired by the natural materials that can be used in home decor. Wood materials and stone are a great way to use textures in the home. Their neutral colors effortlessly blend with many hues. You can pair these natural materials with natural fabrics and fibers such as jute, linen and cotton to finish off the complete coastal style. Take a look at how these designers use natural materials and fabrics throughout the home to bring in the coast. Ready to get the most out of your walls? Good! Because it’s time to them with art and photos! We can’t just hang any old art though, no-no. No one wants to be that person that just puts something in their home because they saw it once in a magazine. We must take steps to be better than that. Take some time to sit down and have an honest, open conversation with yourself about art. Really put some thought into it because it’s something you are going to be looking at it everyday and every guest that enters your home with see. This is why we must choose something fun! We must choose something meaningful! Maybe add some colorful? Maybe something silly? At least make it something cherished and loved! A good part of the fun is the hunt. Heading out on the Wild West that is the internet and searching for your new art. The search for art is a great way to get to know yourself. You find your likes, dislikes and what really calls to you. Art is truly a great way to express yourself and to further imprint onto your home. As always we won’t leave you baby birds without proper art inspiration. This, of course, is just a mere taste of what’s out in the wonderful world waiting to be added to your home. Go out into the world and find a piece that begs to be on your walls! Or realistically log on to Pinterest and type in ‘coastal art’ or something niche like that. Patterns are a staple in coastal home decor. With many of the common patterns used in coastal homes, a new one has been showing up. The geometric pattern has been spotted offering a fun and unique way to add some character and style to a space. Geometric patterns effortlessly make their way into coastal homes because of their playful style. They’re also a quick step away from the classic stripe patterns that often show up in nautical home and beach cottages. The two patterns can be used to play off of each other, but the geometric pattern can quickly steal the show. With the eye catching style of geometric patterns, a little accent piece is all you need. It’s easy to add a fun pillow, throw or rug to add a pop of style to the space. With the sharp lines and repeating patterns our eyes are naturally drawn to the patterns. This creates a fun accent piece that can help carry the eyes through the room. Get inspired by this fun and energetic pattern! The geometric lines and shapes will be a fun addition to the home and add a great focal point! With the new year under way we want to keep the fresh start going. 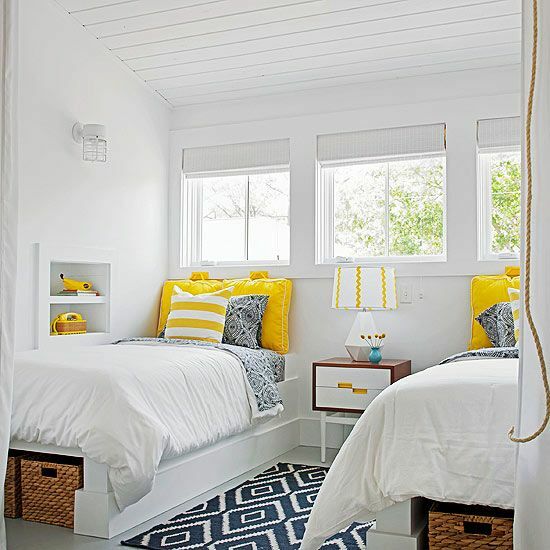 A great way to create a fresh space is to use the white hues to decorate. White is known to invoke feelings of freshness, cleanliness and purity. A designer can use this color to create beautiful space that feels open and airy. White decor is a great way to create a fresh look. The monochromatic color palette is perfectly complimented with natural pieces like woods and metals. They add depth to the space with textures and colors that help break up the monochromatic tone of the space. Keep the fresh start motivation going into the new year going and get inspired with these wonderful white spaces. Looking for a simple addition to your coastal coffee table? Then add a coffee table tray! These are the perfect pieces for the coffee table. They build on the style in the living room by adding another layer to the space. It’s also a great way to keep those accessories or magazines in one place! A coffee table tray can add style, purpose and texture. It’s the triple threat! It can add a clean style line in a modern coastal living room or serve as a place to put those stunning coffee table books and it can even add texture to the space if you choose a wood style tray. It’s time to get that patio ready for spring and summer! Make up the lemonade because it’s time to get outside! It’s beautiful out here in Laguna Beach and we’re hoping it’s the same for everyone else no matter where you are! The patio is a great place to chill out, relax and even soak up some vitamin D. Set your patio up with a beautiful outdoor sofa or a set of rocking chairs to rock the day away in. So what are you waiting for?? Take some tips from these designers and see how they set up these stunning patios! Don’t miss out on this beautiful weather! 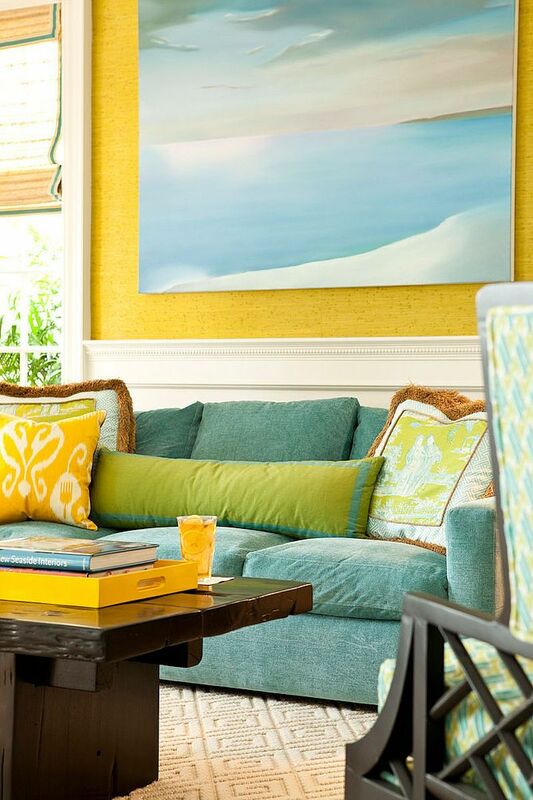 Yellow has been popping up in coastal decor lately and it’s timing is perfect! 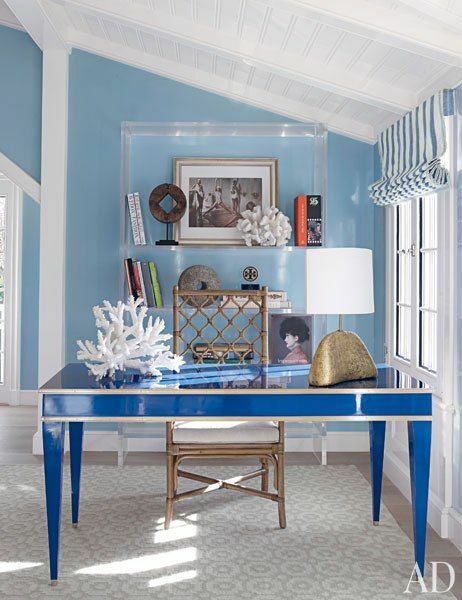 It has always been a staple color in coastal decor. It’s warm, welcoming and reminds us of summer. This time of the season, it’s also a staple color in fall decor. Fall is notorious for the changing leaves which produce bright, vibrant yellows, oranges and reds. The bright, sunshine yellows and dark mustards are coming out at the perfect time in decor this year. It’s a great hue for any coastal home any time of the year, but if you feel like getting festive with fall decor here’s your perfect hue. Take advantage of the range the hue offers and get to decorating! 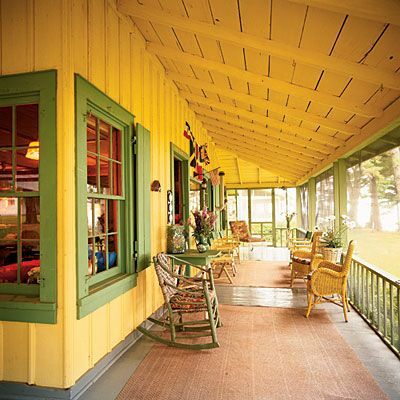 Check out what these designers have done with yellow hues and how they’re using them in these spaces! Having a designated workspace in the home is essential for every home. Whether you work from home or just need a place to write the latest blog post, your home should have a spot for that. 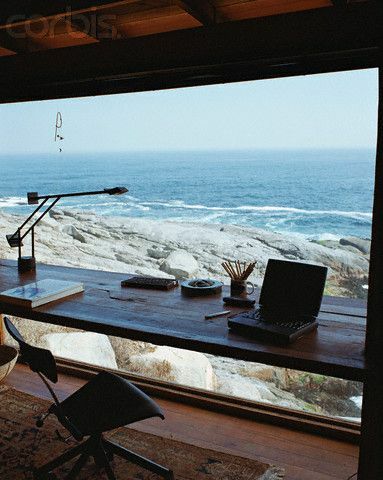 In this post we’re looking at some of our favorite workspaces we’ve found on the web. They inspire us to make our spaces better and, in a weird way, to get work done. Weird, right!? 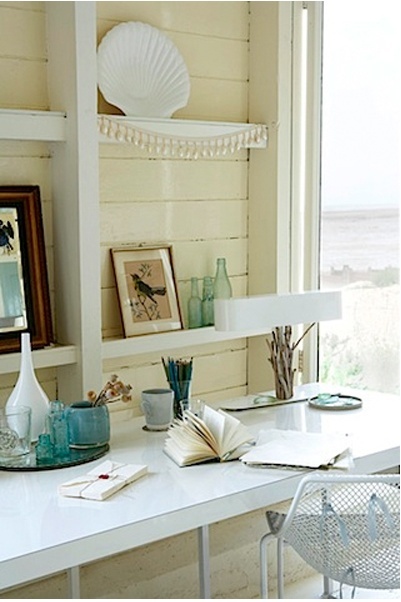 Take a look at these coastal workspaces and pull inspiration from them to start or finish yours!